This project was created on 03/03/2019 and last updated 2 months ago. The AS5600 magnetic encoder is a 12-bit programmable encoder. The magnetic field from the magnet must be perpendicular to the sensor and the air gap between the magnet and the AS5600 is typically 0.5mm to 3mm. The AS5600 breakout board positions the encoder directly above a rotating magnet on the NEMA 17 shaft bearing. Additionally, the AS5600 has an analogue output providing data through PWM or analog voltage and digital output is accessed using the I2C protocol. The resolution available is 0.088° leading to increased precision. I2C clock line. R1 pull this pin high. 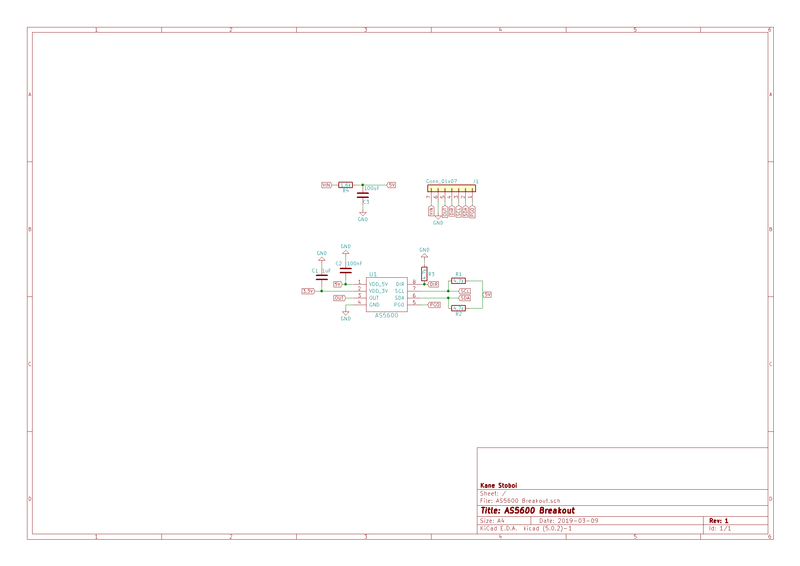 I2C data line. R2 pulls this pin high. Thanks for your schematic, but how can I use this to access Ramps and Marlin? I did my dissertation on a project which used a very similar setup. Looking cool! Closed-loop control is an interesting topic with plenty of research still to be done, particularly in the efficiency of driving methods. I&apos;d be ken to know what your dissertation was on. My dissertation was looking at the use of closed loop BLDC motor control to actuate rotary haptic feedback effects. Essentially making a BLDC motor feel like a variety of different controls when turned by hand, through the use of software. I really enjoyed it and wished I could have spent more time on it. I often think about revisiting it in my free time. Your project is an inspiration to do just that and would likely give me a starting point. At university, I was following on from a student from the previous year, and was using a laser-cut enclosure to hold the motor above the sensor in the correct location. My project also used a magnetic field sensor. Sumix, I see you have full PID solution. Any thoughts on the simplified digital paper? May save some time over full PID for this application. AS5600 has the problem with the wrong occour between two byte . Be careful! Thanks, can you clarify what two byes you&apos;re referring to please? Very slick, should make a lot of projects easier. Can&apos;t wait to see the details. Thanks Dan, shouldn&apos;t need to wait too long hopefully. Slowly getting everything ready to publish. Magic, I was looking at this problem recently for my SCARA to control oscillation (overshoot/undershoot). There is a paper for a simple digital PID controller that sits between the Controller (i.e GRBL) and the stepper motor drivers. If you put an AVR on board (perhaps as the holes for an ATiny85 or similar) then the solution would be complete. Thanks for the feedback Alan. I&apos;m currently doing research into incorporating an onboard microcontroller and potentially a motor driver to compensate for any missed steps. I hope to be updating this regularly over the coming months. It&apos;s a great idea and is awesomely open-sourced. I have had this on my list of cool projects to fork and play around with but i just haven&apos;t had the time. I&apos;d love to see your take on closed loop stepper motors! I wasn&apos;t aware of the Mechaduino sumix however I have come across the uStepper (http://www.ustepper.com) which is very similar. These are excellent products and have enormous potential. Having an all in one solution is a valuable resource, however, the user is limited to the functionality of the onboard microcontroller and motor driver. This is why the primary focus of this project is to find the middle ground between products like the Mechaduino/uStepper and open-loop control. By providing a standalone encoder solution the types of applications can vary greatly and expand to incorporate the most suitable hardware for a users need. OCXO (and VCXO) sensitivity is never well defined in industry, which is what I've attempted to do here. You are about to report the project "AS5600 Stepper Motor Encoder", please tell us the reason.